The McCombs School of Business is celebrating the opening of its new 497,500-square-foot graduate business facility, Robert B. Rowling Hall, today at The University of Texas at Austin. AUSTIN, Texas — The McCombs School of Business is celebrating the opening of its new 497,500-square-foot graduate business facility, Robert B. Rowling Hall, today at The University of Texas at Austin. 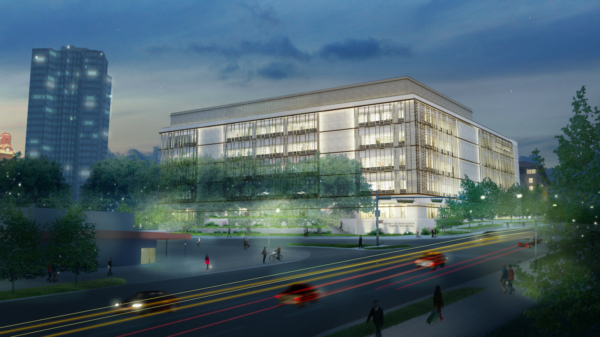 Rowling Hall will house the Texas McCombs MBA and M.S. in Technology Commercialization programs. It will also be home to the Jon Brumley Texas Venture Labs, the John C. Goff Labs, and the Center for Leadership and Ethics, and it will double the space available for Texas Executive Education programs. Rowling Hall is designed to convene and inspire bright minds and enterprising leaders from around the university and beyond. Every corner of the building, from the expansive entry hall to the Moontower Café, has been created to promote conversation, camaraderie and idea-sharing among students, faculty members, staff members, alumni, recruiters, executives and other business school visitors and guests. Rowling Hall will expand classroom, conference and convention spaces, all of which have been engineered for ultimate flexibility to match the teaching and learning approaches of modern higher education. The facility also includes a state-of-the-art studio for video and sound production, which improves the school’s video networking capabilities as well. Within the new building, hands-on learning will — quite literally — be on display. Transparency is an intentional design element throughout many of the common spaces. Daylight and spectacular city perspectives are visible from the offices, classrooms and collaboration areas, while interior learning rooms and laboratories incorporate transparent design elements to showcase student projects. The McCombs School raised over $58 million in gifts and pledges to help fund the building’s construction. Total project costs, which included funding commitments from the UT System Board of Regents, UT Austin, the AT&T Executive Education and Conference Center and the McCombs School of Business, were approximately $186 million. The new facility comprises five stories above grade and six below grade that are designated for parking. It was designed by Jacobs and Ennead Architects. DPR is the construction manager for the project. Construction began in late 2014.